Slovenian writer Aleš Šteger has published seven books of poetry, three novels, and two books of essays. A Chevalier des Artes et Lettres in France and a member of the Berlin Academy of Arts, he received the 1998 Veronika Prize for the best Slovenian poetry book, the 1999 Petrarch Prize for young European authors, the 2007 Rožanc Award for the best Slovenian book of essays, and the 2016 International Bienek Prize. His work has been translated into over fifteen languages, including Chinese, German, Czech, Croatian, Hungarian, and Spanish. He has published four books in English: The Book of Things, Berlin, Essential Baggage, and the novel Absolution. 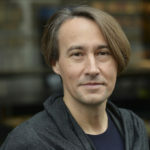 He also has worked in the field of visual arts (most recently with a large scale installation at the International Kochi-Muziris Biennale in India), completed several collaborations with musicians (Godalika, Uroš Rojko, Peter N. Gruber), and collaborated with Peter Zach on the film Beyond Boundaries.